“Who betrayed Dr. Ford’s trust, who in Feinstein’s office recommended Katz as a lawyer, why did Ms. Ford not know that the committee was willing to go to California,” Graham said, listing the elements he wanted looked into. Graham was drawing on a frequent criticism from Republicans regarding how Ford’s allegations of sexual assault against Kavanaugh became public. Graham and other Republicans, including President Donald Trump, have suggested someone within Feinstein’s office leaked information about Ford’s sexual assault allegations against Kavanaugh. Feinstein, the ranking Democrat on the Senate Judiciary Committee, has been repeatedly criticized by Republicans for being aware of Ford's allegation for six weeks and not bringing it before the committee. The senator has said she didn't take it to her colleagues because of Ford's request for confidentiality. The allegation became public when it was reported by The Washington Post. During Thursday’s hearing, Republicans also raised questions about how Ford was put in touch with her lawyer and about why offers for committee staff to travel to California to interview Ford were not known by Ford. 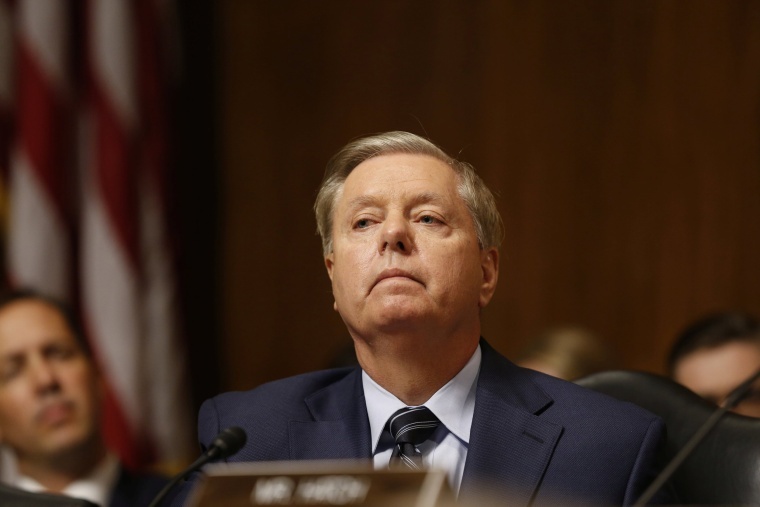 Graham’s demands for a secondary investigation Sunday mark the latest chapter in the ongoing saga surrounding Kavanaugh’s nomination. On Friday, Trump, under pressure from key Republican senators, ordered the FBI to conduct an additional background investigation of Kavanaugh, who faces several sexual misconduct allegations. Trump had said Saturday that the FBI has "free reign" in its investigation, although NBC News reported exclusively that significant restraints have been put on the agency. Top White House staffers again refuted the report Sunday.